This time it was the turn of Litecoin to fork and it has successfully forked from Litecoin’s original blockchain. 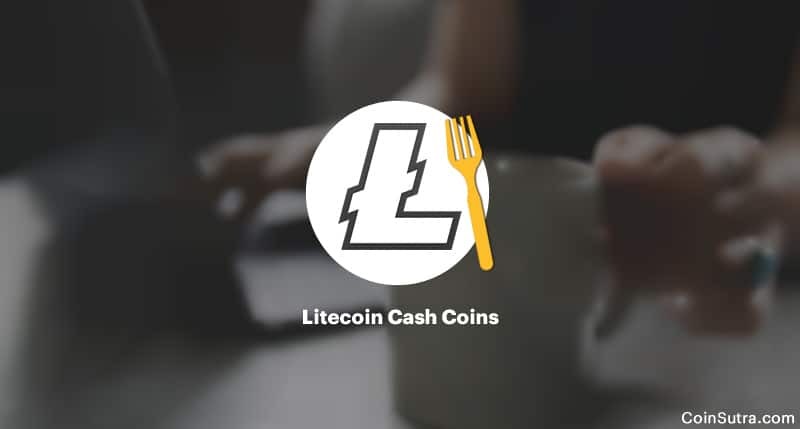 The fork happened on 18th Feb 2018 at the Litecoin block height of 1371111, which is why anyone holding Litecoin at block 1371111 will have 10x as much Litecoin Cash (aka LCC), provided they have their seed/private keys with them. It is a friendly fork and has replay protection in place so you need not worry about using your actual LTC coins. Also, $5.5 per coins is quite decent for free money because the fork ratio is 1:10 which means for every 1 LTC you will get 10 LCC. And last but not least, we have always advised on CoinSutra to keep your cryptocurrencies in your control where you own and have access to the private/seed keys. This time too, those of you who paid heed to our advice and kept their LTC in wallets like Ledger Nano S, Trezor, Mycelium, Jaxx, or other similar wallets, can now claim LCC. Now that we are on the same page, let’s see how to claim and access our FREE LCC using the Coinomi Wallet. We are going to recover LCC from the Coinomi Android wallet. If you already have Coinomi, please update your Coinomi wallet to the latest version. 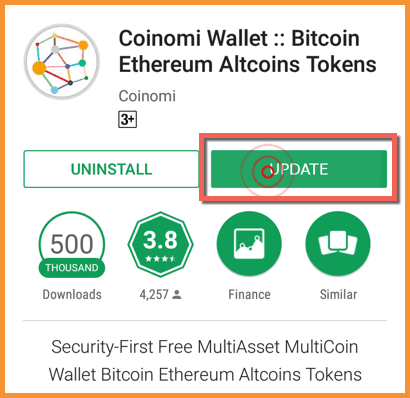 Open your Play Store app, click on the top left menu, select “My apps & games”, and then click on the “Update” button next to “Coinomi Wallet”. 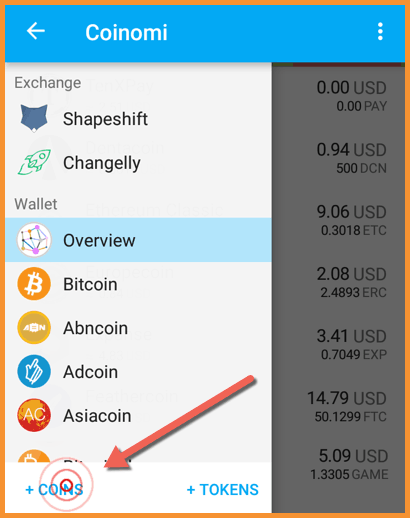 If you don’t have Coinomi, please install the latest version from here on your Android device. #1. Access your LTC wallet where you had your LTC at the time of the fork. Wallets like Jaxx, Mycelium, Ledger, Blockchain.info, Exodus, or any other wallet that supports BIP44 type key generation. Do a simple Google search to check if your BTC wallet is BIP44 supported. #2. Now from these wallets, take your seed words out. Seed words (or recovery phrases) are the 12, 18, or 24-word long phrases that you backed up while setting up your wallet. #3. Now use your Coinomi wallet along with these seed words/keys for restoring your LTC wallet on Coinomi. #4. Once your LTC wallet has been restored on Coinomi using these seed keys, you will be able to see the LTC balance that you had at the time of the fork. #5. 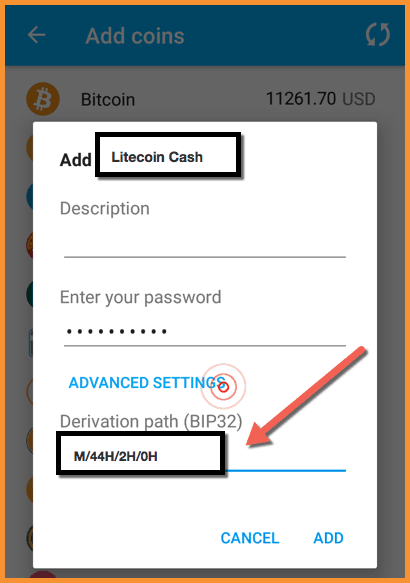 Now in your Coinomi wallet, click on the top left menu, hit the “+ COINS” button and select “Litecoin Cash” from the mind-blowing list of Coinomi’s 86 supported coins and 214 tokens. Note: The character before “H” is the number zero and not the letter O. Your $LCC wallet is now ready and you can see both your LTC and LCC balances. If you have more than one Litecoin wallet in your Coinomi account and you want to claim the equivalent LCC, you will have to repeat the above process, replacing the last zero with the (zero-based) account index each time. So for the second wallet, this would be M/44H/2H/1H, and for the third wallet it would be M/44H/2H/2H, and so forth. Coinomi doesn’t yet support SegWit addresses starting with ‘3’, so with this method, you won’t be able to claim your LCC if you had LTC on a SegWit address at the time of the fork. This doesn’t mean that SegWit address HODLers will not be able to claim LCC; rather, these users have to wait until either LCC’s official wallet comes out or Coinomi starts supporting SegWit addresses. Beware of SCAM wallets/websites surrounding Litecoin Cash who might prey on immature users to get ahold of their seed keys. Don’t use your seed words/private keys on splitting tools or 3rd party wallets unless you are 100% sure about it. Refer to Coinomi’s official fork claiming guide here. Note: Coinomi wallet is getting updated now for LCC and you will be able to claim your LCC through it as soon as it happens. Now it’s time to hear from you: What are you going to do when you are able to claim your free LCC? Are you a HODLer or FUDster? Do let me know your thoughts in the comments section below. If you enjoyed this tutorial, please share it with your friends on Twitter & Reddit! Can You Imagine Installing Up to 18 Apps on Ledger Nano S? Read on. This is great, but on the fork date my LTC was on the Binance exchange, as I had not yet moved it. How do I claim it there? No, luck, you now ask Binance to give it to you, no other way. Hey, what about if my litecoin are on coinbase during the time of fork? How can I claim LCC now? Ask coinbase to provide you the coins, no other work around. do i need to empty my ledger wallet before putting the seed phrase in coinomi? You can do that for extra safety. I’m a HODLer. LCC has a vibrant and dedicated community and very helpful. I was new to the crypto scene and everyone is really nice. I have no Idea why people thought it was a scam and still think it is. ICO’s are scams where they take your money, not give you it like the LCC fork does. I have since increased my holdings as the price has reduced. I experienced a 30 second transaction with LCC so it is mega fast and cheap. Use emulators, somehow run the android app on your pc n then follow the same. I have LTC in my Exodus wallet. If I follow this guide does my LTC move into Coinomi wallet? Would I then have to move the LTC back in order to see it in Exodus? Your LTC will be accessible from both the wallets. Followed the procedure but used ‘sweep other wallet’ instead. LCC appeared instantly! Thanks for the info! Hello – Is there a deadline to claiming your LCC if you had LTC at the time of the fork? Not really, you can go ahead. How do I claim my LCC if I was holding my LTC on a paper wallet? Thanks in advance! What if I sold my litecoin after the fork but never claimed the litecoin cash? You should be able to claim provided you have the old keys or seed. Thanks! I have used this process to claim BTG and am now trying with LCC. I had LTC and BCC on the Jaxx Wallet at the time of the forks. I restored the wallet and as I said this did allow me to claim my BTG, but when I go through the process for LCC it shows me transactions of receiving-great, but then on Feb 12 it shows transactions of all my LCC being sent. Problem is, I didnt send it…any ideas what is happening? I found them! No worries, they were linked to a different Jaxx wallet.